What is the Richmond Land Bank? The Richmond Land Bank is a new program of the Maggie Walker Community Land Trust. In addition to building and providing permanently affordable homes, MWCLT will now begin receiving tax delinquent and vacant properties from the City of Richmond in bulk. Through a strategic, streamlined, and transparent process, the Richmond Land Bank will transfer these properties to nonprofits and community organizations to transform these liabilities into neighborhood assets, including affordable homes, gardens, and other amenities. Land banks are entities that acquire, maintain, and return vacant and blighted property to productive uses. Land banks may be municipal authorities or nonprofits and generally work within a certain locality or region. Land banks help leverage public and private resources to transform “problem properties” into community-oriented assets. In this role, land banks serve as the intermediary between local governments, who assist in land acquisition, and community organizations, who need land to advance their missions. The first land banks were established in St. Louis and Cleveland in the 1970s to triage widespread disinvestment and vacancy in urban neighborhoods. However, states did not widely adopt land bank enabling legislation until the early 2010s. As of January 2018, there are more than 170 land banks across the nation. Land banking activities vary depending on local market and socioeconomic needs. Why does Richmond need a land bank? 1. The distribution and use of land have been—and remain—key to Richmond’s history. A land bank acts an important tool for moving the City toward greater social equity by expanding housing opportunities to historically disenfranchised communities and ensuring land is available to create the components of inclusive neighborhoods. 2. Richmond’s real estate market is heating up, but the benefits are unevenly distributed. Many low and modest income Richmonders cannot afford to buy a home in the City, especially as some traditionally working-class black neighborhoods neighborhoods are currently experiencing rapid price increases. At the same time, there are roughly 2,000 long-term tax delinquent properties across the City. The majority of these long-term delinquent properties sit vacant, acting as liabilities to the immediate and surrounding community. A land bank can help catalyze these properties into more affordable homes. 3. We must improve the process to return tax delinquent properties to productive use. While the City’s efforts to sell tax delinquent properties at auction recoups needed funds, most of these parcels have yet to be returned to productive use. At the same time, direct transfers of tax delinquent properties to nonprofit entities for affordable homes have totaled fewer than 30 since 2010. How did MWCLT become the City’s land bank? In 2016, the Virginia General Assembly passed the Land Bank Entities Act, which enabled localities to create land banks in Virginia for the first time. The Act also permits localities to assign land banking authority to existing nonprofit organizations. In 2017, MWCLT, in coordination with the Richmond Community Development Alliance (RCDA), elected to pursue this designation from the City of Richmond in order to create a more robust, efficient transfer of tax delinquent properties to nonprofits for affordable housing and other uses. MWCLT worked with City staff and elected officials to draft the necessary ordinance to make this designation. In February 2018, City Council adopted Ord. No. 2017-196, which officially designated MWCLT has the land bank for the City of Richmond. A memorandum of agreement (MOA) was drafted and attached to the ordinance to outline the relationship between MWCLT and the City. What does the annual plan do? Pursuant to the MOA, MWCLT will produce an annual plan for the Richmond Land Bank each year. The 2018-2019 Annual Plan is available here. 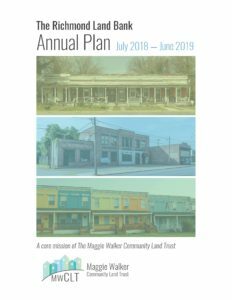 This annual plan sets the vision, goals, and strategies for the land bank, including the designation of priority neighborhoods for property transformation. What are the Richmond Land Bank’s priorities? The main priority of the land bank will be the creation of affordable housing in the City of Richmond, including permanently affordable homes. Subordinate priorities of the land bank will include retail/commercial/industrial activities, historic preservation, public spaces, and urban agriculture. How will the Richmond Land Bank acquire property? Direct sale: Acquisition of tax delinquent property via the City-initiated “direct sale” method outlined in Virginia state code ($ 58.1-3970.1). Only properties assessed below $100,000 are eligible. Properties assessed between $50,000 and $100,000 must be used for affordable homeownership (with buyer below 100% Area Median Income). Surplus transfer: The City of Richmond may elect to transfer certain City-owned parcels to the land bank, pursuant to Ord. No. 2017-069. Market purchase: The land bank may acquire property on the open market if deemed necessary and strategic. Donation: The land bank may receive donated property from a person or entity. How will the Richmond Land Bank decide what to do with property it receives? As properties are designated to the land bank, staff will make initial assessments based on a parcel’s current land use and zoning regulations, along with community needs determined by community members. A Citizens’ Advisory Panel (described below) will make final decisions on property uses and final recipients. Both staff and CAP members will be guided by an annual plan for the land bank, as well as the City of Richmond’s master plan and any applicable small area plans. What is the Citizens’ Advisory Panel? The CAP was established by the memorandum of agreement with the City of Richmond as the primary entity responsible for decisions on property use and disposition. The CAP serves as the intermediary between the public and the land bank. Five members of the CAP will be appointed by the City and four will be appointed by the MWCLT board of directors. CAP meetings will be open to the public and MWCLT will make all announcements, materials, and minutes available online. Who will receive land bank properties? MWCLT will begin accepting applications from nonprofit organizations and community groups in early 2019. Applications will also be made available for individual residents seeking land for less intensive uses, such as gardens. How will the land bank maintain properties it holds? The Richmond Land Bank intends to transfer property to end users as quickly as possible, so that each parcel is returned to productive use without delay. However, the land bank may also need to strategically hold a property in the bank for an extended period. In either case, the land bank will remove any nuisances from the property (e.g., overgrown vegetation) and secure any structural hazards. The land bank prioritize neighborhood members to complete this work. How much will it cost to buy properties from the land bank? The land bank will acquire tax delinquent properties from the City for the costs of attorney and court fees. These costs are normally around $2,000. Upon final transfer, the land bank will charge these costs to the purchaser plus a minor administrative fee. Alternatively, the land bank may offer long-term, low-cost ground leases for persons or organizations in lieu of purchase. When will the Richmond Land Bank become operational? Land bank staff are currently working with the City of Richmond to determine the process and procedure for transferring properties. We expect to have certain tax delinquent properties designated for the land bank in early 2019, with transfers beginning in mid 2019. During this time, the City and the land bank will appoint members to the CAP so that it is established well in advance of any property conveyances. Over the coming months, the Richmond Land Bank will work with residents and community organizations to help guide its operations in 2019 and beyond. To learn more about these plans and other opportunities to become involved, contact us directly at landbank@mwclt.org.